The 54th annual American Translators Association conference was held this year in downtown San Antonio, Texas, just a short walk from the Alamo and the beautiful Riverwalk. The conference was a huge success on several fronts: it drew over 1,400 attendees from all over the world, and it was the first year that featured “Buddies Welcome Newbies,” a way for newcomers to pair up with experienced attendees and receive some personal advice and an instant friend. Other new items on the program were the Résumé Exchange and “For the Love of T&I,” where attendees were encouraged to write down why they have a passion for translation and interpreting, and to share it with others. 1. Buddies Welcome Newbies met with overwhelming support from buddies and newbies alike; with over 160 people registered to participate, the room was filled to capacity, and then some! 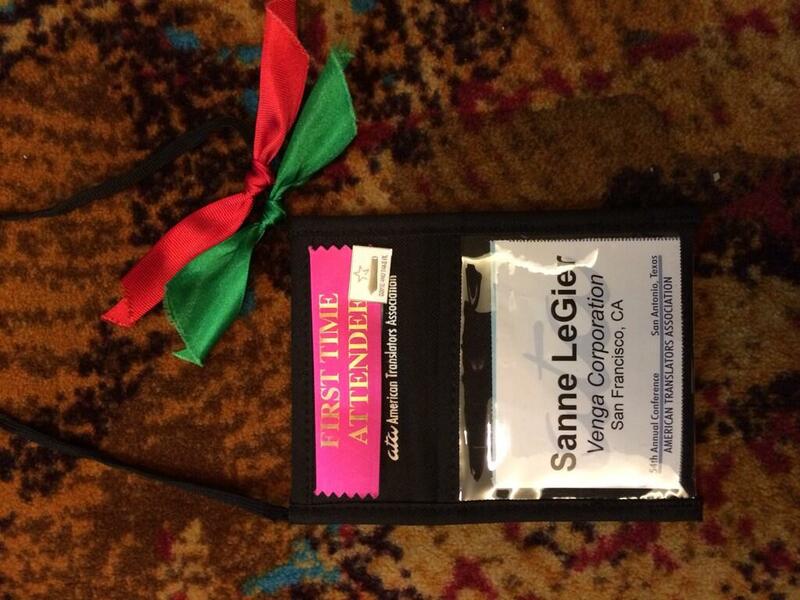 Some buddies even took on more than one newbie, and during the rest of the conference it wasn’t uncommon to see participants touting green or red ribbons (green for newbies and red for “ripe” buddies) tied to their nametags. It was exciting to see so many newcomers receive encouragement and advice from seasoned translators. One newbie approached us during the conference and said she had not been able to attend the Wednesday evening event. However, three experienced ATA attendees had approached her and asked if they could be her buddies! She was thrilled, because she left the conference with three solid professional contacts. The event was experimental in that it was the first time something like this has been done at an ATA conference, and while there are some glitches to work out for next year, we received a lot of positive feedback about it. We were aware of challenges with the pairing process, and because we didn’t have a one-to-one match in the total numbers, never mind language pairs, we decided to go with random pairing on the spot. We did email people with special requests connecting them with an appropriate newbie or buddy ahead of time, and that worked well. The random pairing also made it easier for walk-ins to participate. See some of the feedback we received below. As one attendee noted, “This year’s newbies are next year’s buddies!” Be on the lookout for ways to be a buddy to someone else in the industry. 2. Networking, networking, and a little more networking! From the welcome reception to the conference dance party, the ATA conference focused heavily on networking opportunities. There was an additional chance for freelancers and clients to connect this year at the Résumé Exchange. At this event each person was given one of two stickers to wear on their nametag: “Ready to work” or “Ready to hire.” Tables were set up with signs indicating different fields of expertise, and participants were encouraged to meander and give their résumé to interested employers. Other networking events included the hectic but enjoyable speed networking session and the many division dinners and events which allowed members to get to know others in their fields. The networking you do at conferences like this one will be valuable to you for years to come, so be sure to take advantage of these opportunities! 3. Continuing education! There were sessions on almost every topic imaginable. Most of the sessions are available on the eConference, but being able to interact with other people interested in the topic in real time is invaluable. Even attending sessions that don’t directly apply to what we do every day can be very interesting! I (Helen) find that some of my favorite sessions are the one or two “impractical” sessions I go to. 4. Follow-up is key. This was one of the points we stressed at the Buddies Welcome Newbies wrap-up session. Having a successful and enlightening conference experience but not following up on the information you received and the contacts you made is akin to planting a seed and then leaving it alone, in the hopes that it will water and nurture itself! Step one for newbies who received a buddy during the conference is to send an email thanking your buddy for volunteering their time to help you. It’s a good idea to write to new contacts you made (probably by email or Linkedin messages) within a few weeks of the conference. Be sure to go through the notes you took and business cards you collected to identify anything that merits follow up. 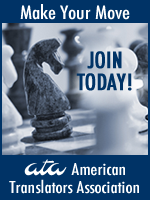 The ATA annual conference can be beneficial to translators and interpreters at any stage in their careers, and all it takes is one excellent contact or piece of advice to make it worth your while. If you didn’t make it this year, start planning your trip to Chicago next year!